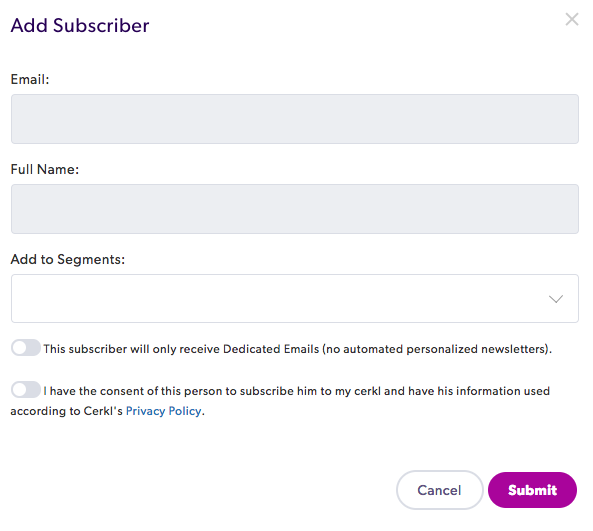 Adding subscribers to your Cerkl newsletter subscriber list is as easy as following these steps! Select Audience Manager > Add Subscribers. You have the option to either add an individual subscriber or you can import a list. 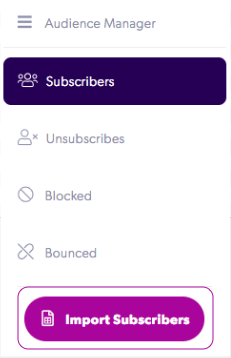 To manually add a subscriber, click on the purple "Add Subscriber" button in the top right hand corner of the page. Next, enter the subscriber's email, enter their name, and then add them to any segment you'd like. 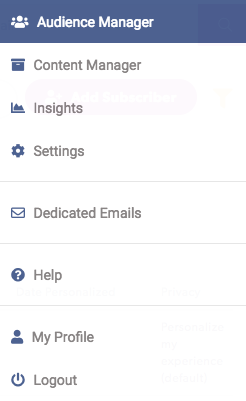 You can also enable a subscriber to only be able to see Dedicated Emails if you believe this is necessary (Pro Tip: we don't recommend it in most cases). Then, designate that you have consent from the subscriber to add them to your email list (provided that you actually do have consent-we don't like breaking the law here at Cerkl!). If you'd like to add an entire subscriber list, click the "Import Subscribers" button on the left side of the page. Then, upload the file with the list of subscribers. For more information on uploading an entire subscriber list, click here. Pro tip: You can always add additional subscribers after your initial upload.